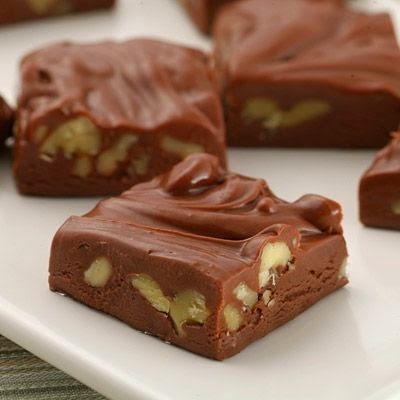 NESTLÉ® TOLL HOUSE® Famous Fudge | FoodGaZm.. I love this fudge! It's something that can be made quickly and the end results are perfect.. I made this fudge for the first time last week and it is amazing! Everyone that I shared it with just loved it. I love how easy it is to make. This is going to be made very often at our house! Especially for pot lucks when I have to bring the dessert..
LINE 8-inch-square baking pan with foil. COMBINE sugar, evaporated milk, butter and salt in medium, heavy-duty saucepan. Bring to a full rolling boil over medium heat, stirring constantly. Boil, stirring constantly, for 4 to 5 minutes. Remove from heat. STIR in marshmallows, morsels, nuts and vanilla extract. Stir vigorously for 1 minute or until marshmallows are melted. Pour into prepared baking pan; refrigerate for 2 hours or until firm. Lift from pan; remove foil. Cut into 48 pieces. SUBSTITUTE 1 3/4 cups (11.5-oz. pkg.) NESTLÉ® TOLL HOUSE® Milk Chocolate Morsels for Semi-Sweet Morsels. SUBSTITUTE 1 2/3 cups (11-oz. pkg.) NESTLÉ® TOLL HOUSE® Butterscotch Flavored Morsels for Semi-Sweet Morsels. SUBSTITUTE 1 2/3 cups (11-oz. pkg.) NESTLÉ® TOLL HOUSE® Peanut Butter &amp; Milk Chocolate Morsels for Semi-Sweet Morsels and 1/2 cup chopped peanuts for pecans or walnuts.